Penny Parker is a teen-aged sleuth and amateur reporter who has an uncanny knack for uncovering and solving unusual, sometimes bizarre mysteries. The only daughter of widower Anthony Parker, publisher of the "Riverview Star," Penny has been raised to be self-sufficient, outspoken, innovative, and extraordinarily tenacious. Her cheerful, chatty manner belies a shrewd and keenly observant mind. Penny was the creation of Mildred A. Wirt, who was also the author of the original Nancy Drew series (under the pseudonym Carolyn Keene). Wirt became frustrated when she was pushed to "tone down" Nancy Drew and make her less independent and daring. With Penny Parker, Wirt had a freer hand and received full credit. Wirt once said, " 'I always thought Penny Parker was a better Nancy Drew than Nancy is." 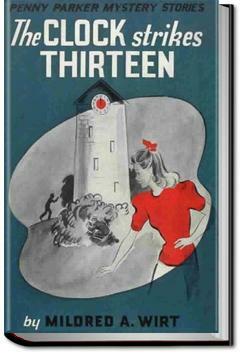 In "The Clock Strikes Thirteen," Penny is confronted by two mysteries that ultimately converge. First there is the odd extra chime from the Hubell Clock Tower at midnight and the inexplicable replacement of the dedicated old clock tower caretaker by a shiftless friend of a real estate developer. Then there is a series of terrorizing attacks of local farmers, including a barn burning. The attacks appear to be the work of a band of thugs known as the "Night Riders." With the help of her friend Louise, Penny works to solve the dual mystery before an another attack and to save an innocent man from jail. “I didn’t mean to intimate that you were careless—” Penny began. She did not complete the sentence, for Charley Phelps slammed the door in her face.